Arnold Donald is President & Chief Executive Officer of Carnival Corporation & PLC, the world’s largest travel and leisure company. Their ten cruise brands -- Carnival Cruise Lines, Holland America, Princess, Seabourn, AIDA, Costa, Cunard, P&O UK, P&O Australia and Fathom are based throughout North America, Europe, Australia and Asia and maintain a fleet of more than 100 ships and serve more than 12 million guests annually. Carnival Corporation & PLC is included in both the S&P500 and the FTSE 100 indices and trades on both the New York and London Stock Exchanges. 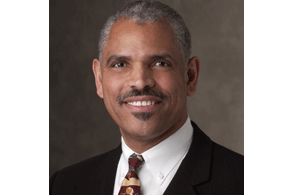 Mr. Donald has been President & CEO of Carnival Corporation since 2013 and served on the board for 12 years before that. He serves on the board of Bank of America Corporation and Crown Holdings, Inc.
Mr. Donald spent more than twenty years at Monsanto Company as Corporate Senior Vice-President, and President of the Consumer and Nutrition sector and President of the Agricultural sector. After leaving Monsanto, Mr. Donald was Chairman of Merisant Company whose products included the leading global sweetener brands Equal and Canderel. Prior to Carnival, Mr. Donald was President and CEO of the Executive Leadership Council, a professional network and leadership forum for African-American executives of Fortune 500 companies, and the President and CEO of the Juvenile Diabetes Research Foundation International. A native of New Orleans, Mr. Donald received a Bachelor of Arts degree from Carleton College, a Bachelor of Science degree in mechanical engineering from Washington University in St Louis, and a Masters of Business Administration from the University of Chicago Graduate School of Business. Mr. Donald serves on the boards of Carleton College in Northfield, Minnesota and Washington University in St. Louis, in Missouri, The Greater New Orleans. self-park and pay via Pay-by-Phone. For more information, contact Blanca Ripoll at 305-284-5206. If you would like to stop receiving emails from the University of Miami, click here.